Looking to create a beautiful blog, posts, pages and widgets for your website then you need to use the best shortcode WordPress plugins for your site. Shortcodes are the easiest method to add varieties of features and functionalities in your posts and pages. It is one of the easiest ways to add custom content to your site. Instead of wasting multiple lines and time in writing a code for creating any widgets or websites, use a shortcode to get the thing done in a simple way. A shortcode is the easiest process to live your content in just a few seconds by simply copying the code wherever you want to be on your site. Having a shortcode WordPress plugin on your website is the perfect solution to spicing up your site or reduces risk to re-do everything when you’ll switch to the themes. In this content, you’ll find a free & premium top shortcode WordPress plugins which are suitable for the various site. 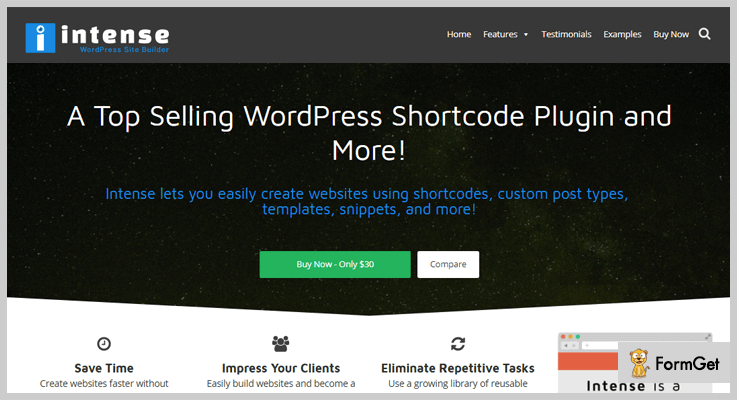 The plugin is the simple and easy to use shortcode WordPress plugin. This premium WordPress shortcode plugin helps to boost your WordPress site. Creating a shortcode is so easy with the help of GT ShortCode editor dialogue boxes. 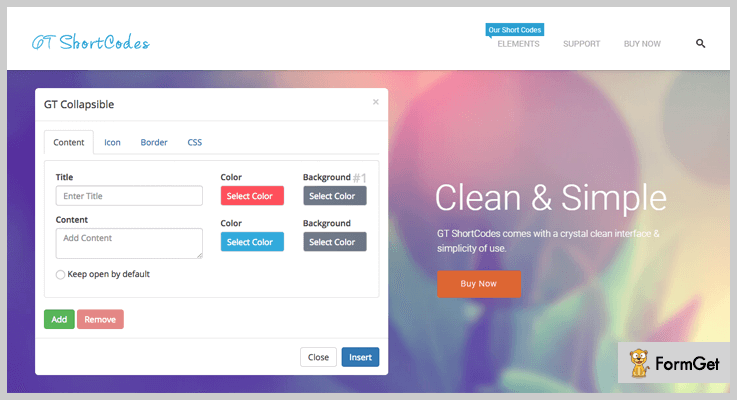 GT shortcode is a simple and responsive WordPress plugin which allows you to insert block quotes, icons, google map etc. Get tons of features at just $21 with 6-month supports. Get its unlimited of features at $105 with 6-month supports. The plugin is simple, clean and flat designed shortcode element. It automatically clears the data from a database on De-activation. GT ShortCodes is easy-to-use shortcode generator. Completely responsive and light weighted. 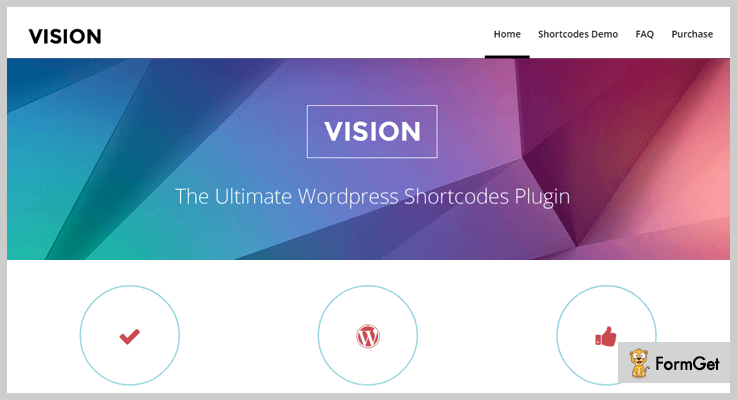 Vision is the top premium shortcode plugin WordPress. This plugin comes with tons of functionalities and customization setting for each shortcode. The plugin supports modern designs which will make your pages & posts shiny and standardized. It provides you more than 100 shortcodes. Buy the services of vision shortcode plugin at $25 with 6-month support. Buy the unlimited services of vision plugin at $125 with 6-month support. Full of gorgeous animated designs, colors, and shapes. This shortcode gets added automatically to the WordPress content. Completely responsive and comfortable on any devices. Quickly and easy to setup plugin. 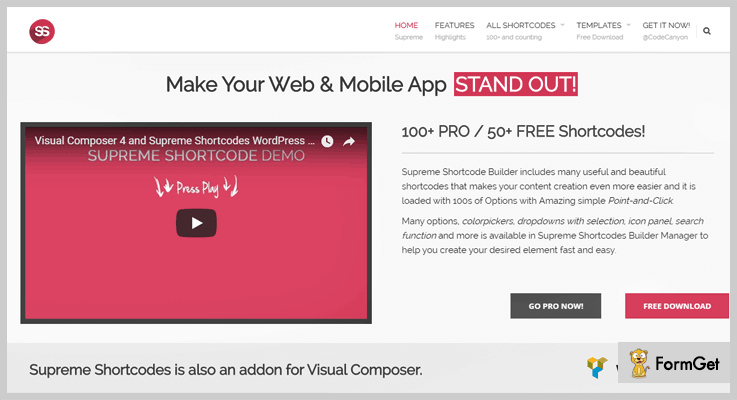 The supreme shortcode is the plugin that is the complete solution to create a beautiful WordPress website. 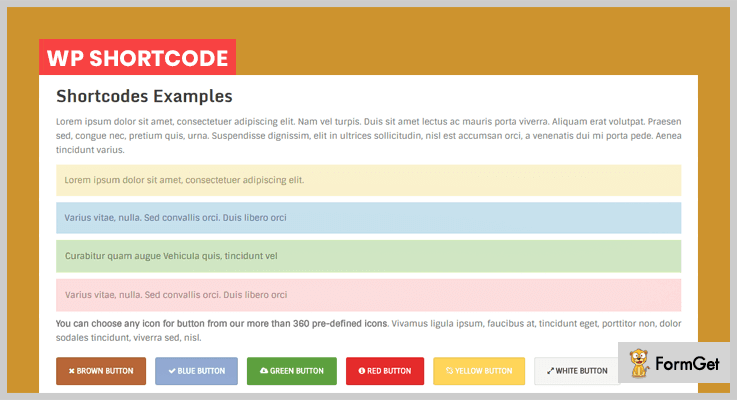 This premium shortcode plugin provides you a static element like responsive rows, animated designs, lines, boxes, 3D Buttons and more. It also provides 100+ extra customizable functionalities and features like Toggles, Popovers and much more. Regular License: At $21 with 6 month supports for basic features. Extended License: At $105 with 6 month supports for unlimited features. This plugin is built on Twitter Bootstrap framework for responsive design. Provides 100% accurate display on any screen. Easy to use shortcode WordPress plugin. It comes with parallax designs. 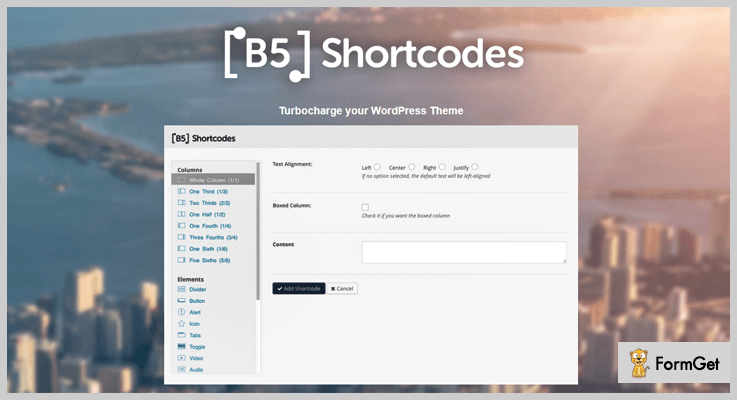 This B5 shortcode is the powerful yet premium WordPress plugin that charge and increase the visibility of your WordPress site with a powerful shortcode. It easily composes the graphic elements into your website. Using this B5 shortcodes plugin into your website you will be open the door to add more than 100+ functionalities into your site. Get it varieties of features at just $21 with 6-month supports, and increase its unlimited features at $105 only. The plugin speeds up your work time due to its fastest services. Provides you an image slider options to present more pleasantness into your site. Also provides audio, video, icons, quotes and much more. It integrated with Google Maps as well. The intense plugin is the most powerful shortcode WordPress plugin designed by CodeCanyon. This plugin gives you the flexibility to include 40+ more awesome shortcodes in your website to create a custom looking posts and pages. Get its varieties of features at just $30 and extends its services from $150. The plugin is built in Twitter Bootstrap. Includes parallax effect to provide more excellent designs. 100% responsive and creates easily templates to display in custom pages. 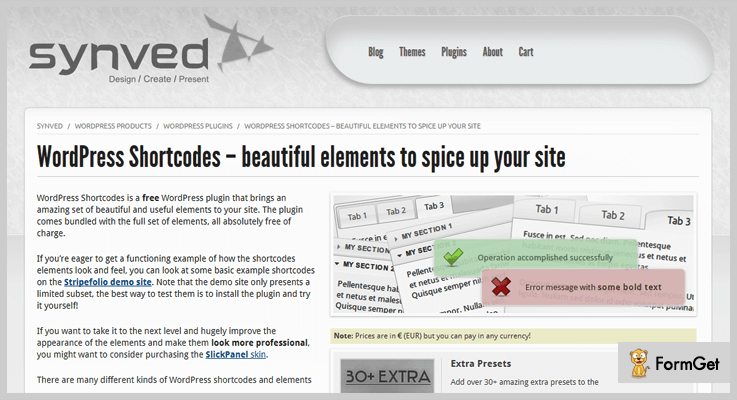 This ultimate widget shortcodes plugin provides power pack of shortcodes. And one of the premium rich & users favorable shortcode plugin. The plugin includes a various collection of visual and functional elements which you can use this in the post editor, widgets, and much more. Download the plugin from its official site wordpress.org. It provides 15+ additional shortcodes. Give 60+ additional skins for plugin shortcodes. 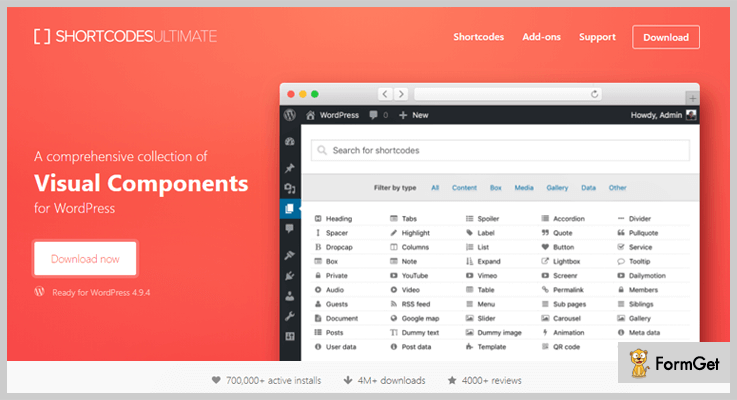 Creates your own custom pages with shortcodes ultimates. This WordPress shortcode is a free WordPress plugin that fills quick makeover into your sites. The plugin will make your website alive by bringing a remarkable set of useful elements to your website. This plugin helps you to improve the appearance of your business and gives your website an advanced look. This plugin is completely Free. Download its free version from an official website wordpress.org. The plugin contains more than 26+ shortcodes and different elements. Create various sections like tabs, accordions, layouts etc. Quick and easy to use shortcodes and elements. Quickly easy insertion and editor. This Free WP Shortcode is the premium list WordPress plugin which offers its numerous of features at Free of cost only. This plugin is completely easy to use and customized plugin. Easily add buttons, alerts, videos, and much more. The plugin required only single click installations. This plugin is completely Free. Download it now to take more and more advantages. It is completely responsive and accurate fits on any screens. Supports various forums to increase your website’s visibility. Provides more than 24+ useful shortcodes. In this post, we offered you an in-depth overview of shortcode WordPress plugin. All these plugins are full of feature list and one of the easiest way to add custom content to your site. For any suggestion and queries do comment us below!